as you explore a sewerload of absurd conspiracies. Granola mom Lynn Grady is on assignment as restaurant critic Our Zen Gourmet when a hostile phantom voice invades her head. A stranger appears and, after blocking the voice with an improvised tin-foil hat, recruits Lynn for a hydroponic-farm-to-fork tasting gig. But a surprise attack by armed French waiters plunges her into a high-tech underground war—against her grunge-star ex‑husband—with her teenage daughter at stake. Lynn learns that urban legends are not what they seem as she uncovers a pervasive (and entertainingly plausible) consumer products conspiracy. 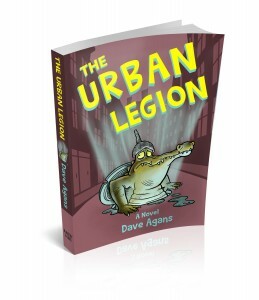 The Urban Legion warps your world in a funhouse mirror. Just got a nice note from David Kohanbash with a pointer to his blog entry on debugging. He was going to post his own rules on debugging, but then found the DebuggingRules! poster and decided to organize his thoughts around that, without having read the book (it was on order.) Very interesting to read–he gets it right (at one point even quoting the same Sherlock Holmes line that I use). I guess this shows that universal concepts are independently discoverable. And once he got the book, he confirmed all this, and highly recommended it. So, thanks for the plug, David!